Each flower stands for a little thing that makes your life joyful and sweet! And you will be reminded of those things every morning while taking a sip of your tea and staring at this mosaic decoration mural. 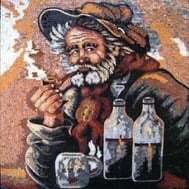 PROs: Handmade contemporary mosaic artwork composed of high-end glass tiles that is guaranteed to transform your space. Mosaicist: Mo AR. CONs: You’ll be surprised how lucky you are every time you pass by these flowers. This stunning mosaic artwork was made by hand to fit any office, retail space, home or garden. Our mosaics are made from natural marble and stones, naturally resistant to different environments (dry, moist or wet) and weather conditions (frost, sunlight or extreme heat).